Yesterday Guy Benson posted an article at Townhall about the recent Texas Senate race between Robert Francis O’Rourke and Ted Cruz. Robert Francis O’Rourke goes by the name Beto O’Rourke. “I decided to write a book about the Cult of the Dead Cow because they were the most interesting and influential hacking group in history. They illustrated a lot of the things that I think are fascinating about hacking and security work. “While I was looking into the Cult of the Dead Cow, I found out that they had a member who was sitting in Congress. I didn’t know which one. But I knew that they had a member of Congress…And then I figured out which one it was. And the members of the group wouldn’t talk to me about who it was. They wouldn’t confirm that it was this person unless I promised that I wouldn’t write about it until after the November election. That’s because the member of Congress had decided to run for Senate. Beto O’Rourke is who it was…After more than a year of reporting, Menn persuaded O’Rourke to talk on the record. In an interview in late 2017, O’Rourke acknowledged that he was a member of the group, on the understanding that the information would not be made public until after his Senate race against Ted Cruz in November 2018. Do you think this information might have changed a few votes if voters had been aware of it? This is only one way the media manipulates the public. Exactly What Does ‘Expanding Voter Rights’ Mean? The Washington Free Beacon posted an article today about a group called “Priorities USA” which seeks to expand voter rights. Kamala Harris’ top campaign lawyer is one of their board members. The group is planning a massive $30 million effort to “expand voter rights” leading up to the 2020 elections. Priorities USA Action, a Washington, D.C.-based group that threw its weight behind Hillary Clinton throughout the 2016 presidential cycle, announced that it will put tens of millions of dollars behind an effort to “fight Republican-backed laws that restrict ballot access,” the Associated Press reports. Guy Cecil, chairman of Priorities USA, told the AP that most of the money will go towards litigation and that the group will begin its efforts by focusing on Texas and Georgia. “We will look at where is the biggest harm being done and where our work can have the most impact,” Cecil said. Marc Elias, a partner at the D.C. office of the Perkins Coie law firm who acted as Clinton’s top campaign lawyer, and who is now the top lawyer for the presidential campaign of Kamala Harris, quietly joined the board of Priorities USA’s nonprofit arm in early 2017 to help the group lead its voter-related efforts. Elias was brought in as the group began to shift its focus to fighting state-level voter identification laws. It is interesting to note that one of the main people behind this effort is George Soros. “We hope to see these unfair laws, which often disproportionately affect the most vulnerable in our society, repealed,” Soros told the New York Times in 2015. Soros had identified expanding the electorate by 10 million voters at a top priority, according to hacked documents released the next year. Soros was also the first funder of a large voter mobilization effort for the 2016 elections led by a coalition of progressive organizations. Soros was one of the top donors to Priorities USA Action throughout the presidential cycle, giving $10.5 million to the group. Soros added $5 million to Priorities during the 2018 election cycle. Priorities USA and Elias did not respond to inquiries on Elias’s potential upcoming involvement with the multi-million-dollar campaign by press time. Why are they fighting voter ID laws? An article I posted back in 2011 might provide a clue. 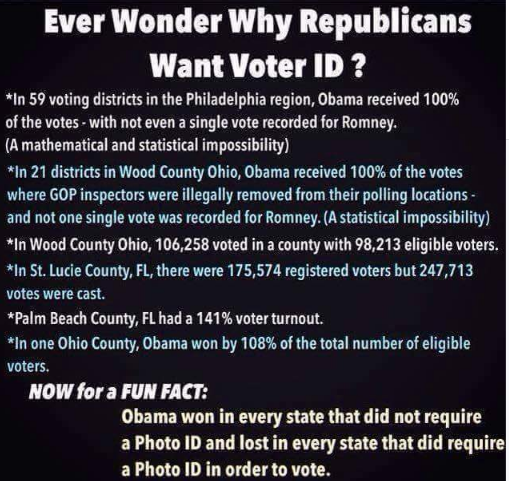 This illustrates why we need voter ID (and why the Democrats are fighting it). Every fraudulent vote cancels out the vote of a legal voter. Eliminating voter fraud is the best way to expand voter rights. On November 21, Bloomberg posted an article about U. S. oil production and the opening of new pipelines in Texas. An infestation of dots, thousands of them, represent oil wells in the Permian basin of West Texas and a slice of New Mexico. In less than a decade, U.S. companies have drilled 114,000. Many of them would turn a profit even with crude prices as low as $30 a barrel. 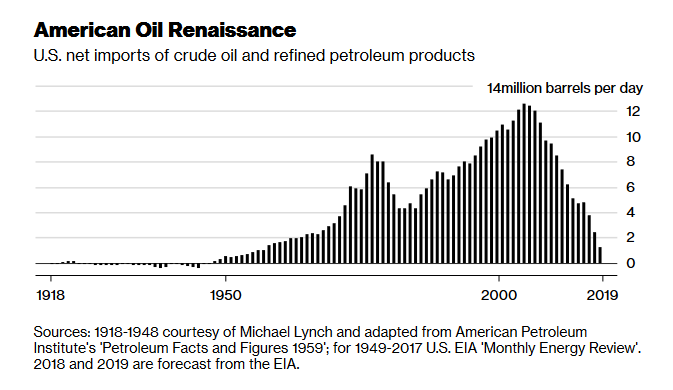 …The U.S. energy surge presents OPEC with one of the biggest challenges of its 60-year history. If Saudi Arabia and its allies cut production when they gather Dec. 6 in Vienna, higher prices would allow shale to steal market share. But because the Saudis need higher crude prices to make money than U.S. producers, OPEC can’t afford to let prices fall. American energy independence creates a major geopolitical shift. We are still dependent on the Saudis to make sure that oil is traded in American dollars, but we are no longer dependent on them to keep our cars moving and our homes heated. Those of us old enough to remember the oil crisis of the 1970’s remember gas lines and rapidly increasing prices. I realize that we will never get back to 30 cents for a gallon of gasoline, but it is nice to see gasoline prices hovering in the mid two-dollar range rather than the four-dollar range. A Fort Worth woman recently indicted on voter fraud charges paid others involved in the scheme with funds provided by a former Tarrant County Democratic Party leader, court documents filed this week say. After learning about a state investigation, Leticia Sanchez — one of four women arrested and indicted on voter fraud charges — allegedly directed her daughter to send a text message to others in the scheme, urging them not to cooperate with investigators, state officials say. The allegations are made in the state’s notice of intent to introduce evidence in Sanchez’s criminal case, where state officials say she was among those who collaborated to vote for certain down-ballot candidates with a number of north side residents’ mail-in ballots. The notice, filed Tuesday, states that Sanchez engaged in organized criminal activity in collaboration with her three co-defendants; Stuart Clegg, a former executive director for the Tarrant County Democratic Party; and others. The article reports that the voter fraud included illegally obtained mail-in ballots Forged signatures were also used on absentee ballots and mail in ballots. Earlier this month, four women were arrested — Sanchez, her daughter, Leticia Sanchez Tepichin, and Rosa Solis and Laura Parra — after being indicted on more than two dozen felony counts of voter fraud. AG spokesman Jeff Hillery declined to comment when asked if any other charges would be filed. This development comes as early voting for the Nov. 6 midterm election is underway. Voters may vote early through Nov. 2. Election Day is Nov. 6. The article suggests that the arrest and indictment of Ms. Sanchez may be a political move because it occurred right before the election, but it seems to me that the time to find and deal with voter fraud issues is before the election. People need to know that there are consequences for committing voter fraud. A report from The Star-Telegram today warns voters to check the voting machines carefully before recording their votes. Texas voters: Take your time when casting ballots. This advice comes as state election officials receive complaints across the state from early voters casting straight tickets on Hart eSlate machines who believe the machines changed their votes. Two complaints, reported through a third party, have been made in Tarrant County, said Heider Garcia, elections administrator. The Texas Secretary of State’s Office has issued a statement about the issue. Evelyn Brown, a 63-year-old longtime Fort Worth voter, said she had a problem voting this week. She had gone to the Southwest Community Center on Welch Avenue and had cast a straight party ticket. When she reviewed the summary, she saw that her choice in the U.S. Senate race — which pits Republican U.S. Sen. Ted Cruz against Democratic challenger U.S. Rep. Beto O’Rourke — had flipped to the candidate in the other party. She spent seven or eight minutes trying to move back to change the candidate in that race, but wasn’t successful. So she called the election judge over who ended up calling the Tarrant County Elections Office. In the end, the election judge had to at least temporarily put that machine out of service. He moved Brown to a different machine, where she said she was able to cast a vote for all the candidates of her choice. Vote carefully, Your country depends on it. Yesterday The Washington Times posted an article about an attempt to commit voter fraud in Texas. The applications were pre-addressed to elections officials, which is likely what left many voters to believe they were receiving an official communication from the state. But the return address was from the State Democratic Executive Committee, and listed an address in Austin that matches the state Democratic Party’s headquarters. On the application, boxes affirming the applicant is both 18 and a U.S. citizen are already checked with an “X” in the Yes field. A person answering phones at the state party declined to connect The Washington Times with any officials there, insisting that a reporter email questions. That email went unanswered. Sam Taylor, spokesman for Texas’s secretary of state, said they heard from people whose relatives were receiving mail despite having passed away 10 years ago or longer. One woman said her child, who’d been dead 19 years, got a mailing asking to register. “It looks like a case of really bad information they are using to send out these mailers,” Mr. Taylor said. He said some of the non-citizens who called wondered whether there had been some change that made them now legally able to vote despite not being citizens. Mr. Taylor said there is a state law against encouraging someone to falsify a voter application, but it would be up to investigators to decide if pre-checking a box rose to that level. Pre-checking the citizenship box encourages someone who is not a citizen to commit fraud. The officials who sent out the mailing with the checked box need to be held accountable and sent to jail. Voter fraud will end much more quickly if it results in jail time. Yesterday Breitbart posted an article about the ongoing battle to institute a voter identification law in Texas. A United States District Court judge dismissed the lawsuit which challenged the Texas voter ID law, announced Attorney General Ken Paxton late Monday. The 2017 Texas voter ID law (SB 5) cleared its final hurdle when the Fifth Circuit honored a request made last month by the opponents of the state’s voter ID law to dismiss any remaining claims since the matter was settled and there was nothing left to pursue in this case. This marked the end of seven years of litigation over the state’s attempts to enact a voter ID law. “”The first thing we started to do was look at houses with more than six voters in them” Engelbrecht (Catherine Engelbrecht, founder of True the Vote) said, because those houses were the most likely to have fraudulent registrations attached to them. “Most voting districts had 1,800 if they were Republican and 2,400 of these houses if they were Democratic . . . It is obvious from the above numbers that Texas has had a voter fraud problem. I suspect many other states have had similar problems. It will be interesting to see how election results change as voter fraud is cleaned up. That may be the reason some organizations are fighting so hard against voter identification laws. Breitbart Texas has reported on the growing number of voter fraud claims statewide which Paxton’s office has prosecuted, including in-person, mail-in ballot, and noncitizen voting cases. Also, the AG increasingly has assisted district attorneys in Texas counties and/or opened voter fraud investigations. Let’s work together to make our elections more honest. America is not a perfect country, but we need to be grateful for the freedom it allows us. We need to make sure those who come here to live understand the freedoms and responsibilities of America and are willing to honor the laws of the country they now reside in. One of the challenges America is facing now is the assimilation of many legal immigrants who have no understanding of western law and western culture. That problem was illustrated recently by events in Texas. The National Review posted an article today about Maarib Al Hishmawi, a sixteen-year old who was reported missing by her father. Two Iraqi immigrants allegedly beat, choked and threw hot oil on their sixteen-year-old daughter because she refused to enter into an arranged marriage that would have netted her parents roughly $20,000, according to local police. The couple, both of whom immigrated to San Antonio, Texas two years ago, are facing family abuse charges, the Bexar County Sheriff’s Office announced Friday. Authorities first became aware of the situation after the alleged victim, Maarib Al Hishmawi, was reported missing in January by her father, 34-year-old Abdulah Fahmi Al Hishmawi, according to the local CBS affiliate. Maarib told police when she was found earlier this month that she ran away to avoid the arranged marriage, which she eventually consented to in order to stop the abuse. …“Several times it was reported to us that this young lady was abused, with hot oil being thrown on her body. She was beaten by broomsticks. At one point she was choked almost to the point of unconsciousness,” said Salazar. Maarib and her five younger siblings have been placed in the care of Child Protective Services. The man who planned to pay Maarib’s parents $20,000 to marry her will likely also face charges. The thing to remember here is that this young lady is lucky to be alive. In Iraq, the parents could have killed her in what is called an honor killing. It is likely that the only reason she is still alive is because the parents wanted the $20,000 they would have received for selling her into marriage. This is the type of problem that is created when immigrants do not understand the laws and practices of America and are not being taught to follow those laws. Yesterday there was an horrific shooting at a church in Texas. The Guardian posted a story yesterday about how the gunman was stopped. An armed citizen engaged the gunman and another citizen pursued the gunman in a vehicle with the armed citizen. The police arrived after the two citizens chased the gunman and held him at bay with a rifle. It took the police between five and seven minutes to arrive. How many more people would have been killed but for the actions of the armed citizen? There is another aspect to this story. Breitbart is reporting today that the man who shot up the church had been denied a Texas concealed carry permit. USA Today chided Texas for “lax” concealed carry laws after the Sutherland Springs church shooting but the attacker, Devin Kelley, was denied such a permit. Mr. Kelley had been denied a concealed carry permit–stricter gun laws would not have mattered in this case because he was not interested in following the gun laws (or the laws against murder). Other sources indicate that he should not have been able to pass any kind of background check to purchase a weapon as he had previously been convicted of domestic violence. There is no way under current gun laws he should have been able to purchase a gun. His rampage was stopped short by a citizen with a gun permit. Unfortunately we will never find a way to stop criminals (or those with criminal intent) from obtaining guns illegally. Therefore it makes no sense to deny law-abiding Americans the ability to defend themselves. Thank God there was a legally armed citizen to stop the rampage. America is made up of 50 different states. Each state is unique–politically, economically, geographically, ethnically, etc. So if people could live anywhere they wanted to, where would they live? Actually, the age of the internet has made that somewhat possible–telecommuting has grown in recent years. So let’s look at where people live. John Hinderaker at Power Line posted an article yesterday about a study of trends in population growth in states within America. The data for the study came from the IRS. The results were not really surprising. …Overall, many of the most affluent states are the ones hemorrhaging high-income earners the most rapidly. As in overall migration, New York sets the standard, with the highest outmigration of high income earners (defined as annual income over $200,000) relative to in-migrants (attraction ratio: 53). New York is followed closely by Illinois, the District of Columbia and New Jersey, which are all losing the over-$200,000-a-year crowd at a faster pace than California. Unfortunately voter fraud is a problem in America. There have been instances of voting machines incorrectly registering votes, and there are examples of people voting multiple times under various names. Voter ID laws are an attempt to solve at least part of the problem. Several states have passed voter identification laws, and lawsuits have followed. Texas, at least, is sticking to its guns. An agreement between the State of Texas and groups that attempted to strike down the state’s photo voter identification law came to an agreement Wednesday that will keep the election integrity policy largely in place for the November elections and thereafter. Under the deal, voters with valid forms of photo ID or ones “expired by no more than four years” will be allowed to vote a regular ballot, according to court documents obtained by Breitbart Texas. In trade, individuals presenting a valid “voter registration certificate, certified birth certificate, a current utility bill, a bank statement, a government check, a paycheck, or any other government document that displays the voter’s name and an address and complete and sign a reasonable impediment declaration shall be permitted” to vote a regular ballot as well. North Carolina is currently involved in a lawsuit against its voter identification laws–despite the fact that voter turnout was up when the laws went into effect in March. Hopefully, North Carolina can find a way to follow the example of Texas. The gas pipeline plans in the woman’s possession include the Deming region, law enforcement sources say. Deming is a Luna County city situated about 35 miles north of the Mexican border and 60 miles west of Las Cruces. It has a population of about 15,000. Last year one local publication listed Deming No. 1 on a list of the “ten worst places” to live in New Mexico due to high unemployment, poverty, crime and a horrible public education system. The entire region is a High Intensity Drug Trafficking Area (HIDTA), according to the Justice Department’s National Drug Intelligence Center due to the large amounts of methamphetamines, heroin, cocaine and marijuana smuggled through the state by Mexican traffickers. Specifically, the renowned Juárez and Sinaloa cartels operate in the area, the feds affirm in a report. These are major reasons we need to secure out borders. This is the latest undercover video from Project Veritas posted on YouTube. It deals with Common Core. “People who say they want to teach the Constitution, only want to teach the part of the Constitution that they like,” she tells the journalist, who then asks her about the Second Amendment. “But yet they don’t want to teach all of it,” she replies. “Damn the Second Amendment. I did a big presentation yesterday for AP US History and the AP US History agenda was set, until Texas got upset about it and they wanted to have their founders – they wanted founders in it. And it’s like – come on. The dead white guys did not create this country. It was a whole bunch of different kinds of people. And yes there were women, and yes there were people of color, and yes…you need to talk about them too. But they want to talk about those dead white guys. Note the hostility to ‘dead white guys’ who wrote the Declaration of Independence, the U.S. Constitution, and the Bill of Rights. Republicans want to get in there and talk about stuff and change things about school stuff because they want to, they want to influence what is being taught. Common core doesn’t put up with that. Common Core is copyrighted–there is no room for local school boards to make changes. PV: I am really glad I’m here in California, whatever religious affiliation you want to take is fine, but in Texas they want to push the Christianity. KK: Because they think it’s the only one. PV: They do, and I see that. KK: That’s why it’s so offensive to have these prayers in the school board. PV: Christianity is totally out of the common core? KK: Yes it is. Totally. It’s not a core concept at all. PV: But then there is a mention of other religions like Islam. Christianity played a part in the founding of this nation–the churches of America played a role both in the Revolutionary War and the Civil War. The settlers at Jamestown and Plymouth Rock both declared America to be a Christian nation–even before it was America. Christianity is an important part of our history. To say that Christianity is not an important part of the America’s history is to leave out a good portion of the story. Free speech is something most Americans take for granted. We don’t necessarily agree with what someone is saying or approve of their language, but generally speaking, we respect free speech. Free speech is under attack in America from a number of directions. Some of them are very subtle and seem almost logical, and some are totally obvious. Both need to be dealt with quickly and openly. As I have stated in previous articles, I am reading Stephen Coughlin’s book Catastrophic Failure, which is about the dangers America faces at the hands of the Muslim Brotherhood and other related groups. The book talks about the Organization of Islamic Cooperation (OIC) and the human rights movement in the United Nations. The book explains that the OIC definition of human rights includes the provision that these rights have to be in compliance with Sharia Law. This means that any negative statements about Islam are not considered acceptable free speech, but are punishable by law and may result in the death penalty. The goal of the OIC is to bring non-Muslim countries under Sharia Law–in America that means ending the First Amendment right of free speech. We saw the OIC in action recently when Pamela Geller was condemned for a “Draw Mohammed” contest in Texas which resulted in violence. She was blamed for the violence–not the people who committed the violence. This was an attempt to turn public opinion away from the idea that all free speech is protected. There is nothing in our Constitution that protects us from being offended. However, the First Amendment does protect our right of free speech. The press response to what happened in Texas was a very subtle attack on free speech. It needs to be exposed and countered. A more obvious attack on free speech was initiated by the U.S. Government recently against “Reason Magazine.” Reason posted an article yesterday telling the story. For the past two weeks, Reason, a magazine dedicated to “Free Minds and Free Markets,” has been barred by an order from the U.S. District Court for the Southern District of New York from speaking publicly about a grand jury subpoena that court sent to Reason.com. The subpoena demanded the records of six people who left hyperbolic comments at the website about the federal judge who oversaw the controversial conviction of Silk Road founder Ross Ulbricht. Shortly after the subpoena was issued, the government issued a gag order prohibiting Reason not only from discussing the matter but even acknowledging the existence of the subpoena or the gag order itself. As a wide variety of media outlets have noted, such actions on the part of the government are not only fundamentally misguided and misdirected, they have a tangible chilling effect on free expression by commenters and publications alike. Yesterday, after preparing an extensive legal brief, Reason asked the US Attorney’s Office to join with it in asking that the gag order – now moot and clearly an unconstitutional prior restraint – be lifted. This morning, the US Attorney’s Office asked the Court to vacate the order, which it did. We are free to tell the story for the first time. Regardless of the legal details, the growing government demand for user data and our own experience with court-enforced silence on a self-evidently ridiculous investigation raise important questions about free speech and the abuse of power. Reason’s unmoderated comment space is rare among comparable publications and has, over the years, developed into a forum that is by turns exciting, intellectually advanced, outlandish, cringe-inducing, and more foul-mouthed than any locker room this side of the Crab Nebula. It is something to be celebrated as a voluntary community that can be engaged or ignored as the spirit moves you (we say that as writers whose work and physical shortcomings rarely escape unscathed from any thread). However trollish many of our commenters can be, they have created a sphere of free speech that delivers on one of the great promises of the Internet, which is unbridled expression, dialogue, and argument. We took risks by creating an autonomous zone in which our readers are left to their own devices. Some of the risk is reputational—how many other serious outlets allow anonymous commenters to run riot as we do? Some of the risk is legal, as in the current situation. One further note about anonymity in our comment threads. Commenting on our site requires registration using a working email address (which is hidden from public view unless a commenter chooses to have it displayed). We also log IP addresses. We do both of these things in order to fight spammers and trolls–people who have shown enormous determination in their efforts to disrupt the discussion. Our commenters are generally a tech-savvy bunch. It is likely that those who have a desire for a very high degree of anonymity are taking control of that themselves, using anonymous email addresses and tools to prevent us from logging IPs connected to them. But Reason.com is not the dark web. Many of our regular commenters voluntarily display either personal website information or their email addresses. In fact, three of the six commenters subject to this very subpoena voluntarily displayed public links to personal blogs at Blogger as part of their comments, one of which further links to a Google+ page. Raising the question: How can the government view these so-called “threats” as so nefarious when people posted them in such a non-anonymous fashion? Please follow the link above to read the entire article. It is an amazing saga of an out-of-control government trying to conceal the fact that it is out of control. Thank you, editors of Reason for standing up to this threat. President Obama stated many times that he did not have the power to grant amnesty to illegal aliens–then he did it. A number of states sued the government to stop the move, stating that it would be damaging to their states. A judge in Texas blocked President Obama’s amnesty program from being implemented. The Department of Justice on Wednesday said it will not make an emergency request to the Supreme Court to lift an order blocking President Obama’s executive action on immigration. …The decision by DOJ means that a Texas federal judge’s order to temporarily block Obama’s controversial immigration executive orders will remain in place, at least for now. In July, the 5th Circuit will hear the appeal of the Obama Administration. The same 5th Circuit is also reviewing a separate challenge on the injunction and will hear oral arguments in that case during the first full week of July. The administration will try to persuade the judges to lift the injunction during that argument. The injunction stems from a larger suit filed by 26 states on whether Obama’s executive actions are constitutional. President Obama has brought executive orders to a whole new level. Hopefully the courts will stop this, as Congress has not exercised its proper role. Andrew McCarthy posted an article in National Review yesterday about the shootings in Texas at the Draw Mohammed event. You may not like the provocateurs’ methods. Personally, I am not a fan of gratuitous insult, which can antagonize pro-Western Muslims we want on our side. But let’s not make too much of that. Muslims who really are pro-Western already know, as Americans overwhelmingly know, that being offended is a small price to pay to live in a free society. We can bristle at an offense and still grasp that we do not want the offense criminalized. It would be easy, in our preening gentility, to look down our noses at a Mohammed cartoon contest. But we’d better understand the scope of the threat the contest was meant to raise our attention to — a threat triggered by ideology, not cartoons. There is in our midst an Islamist movement that wants to suppress not only insults to Islam but all critical examination of Islam. That movement is delighted to leverage the atmosphere of intimidation created by violent jihadists, and it counts the current United States government among its allies. The First Amendment does not give you the right not to be offended. It is almost guaranteed that if the First Amendment is followed you will be offended at some point. That is not the point. The point is that in a free society, everyone has the same right of free speech. If the Muslims who live in America cannot accept free speech, they need to return to a place where it is not honored. If we cave into the threat of violence, then we are in danger of losing our First Amendment rights.